I came across this interesting story in the Memoirs of the Royal Academy of Surgery at Paris, a collection of cases published in English in 1750. Until I looked into it more thoroughly I didn’t realise that this is not just a curiosity but a genuinely pioneering operation. 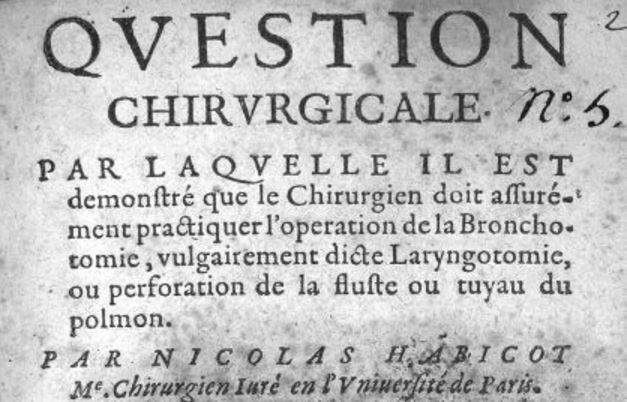 It was documented in a treatise published in 1620 by the French surgeon Nicolas Habicot – and is believed to be the first time a tracheostomy was performed on a child. Habicot’s monograph is all about this operation, which he called ‘bronchotomy’. It was not a new procedure, even then; a few cases are recorded in antiquity, and the great 16th-century surgeon Ambroise Paré is one of several earlier authorities to describe it. 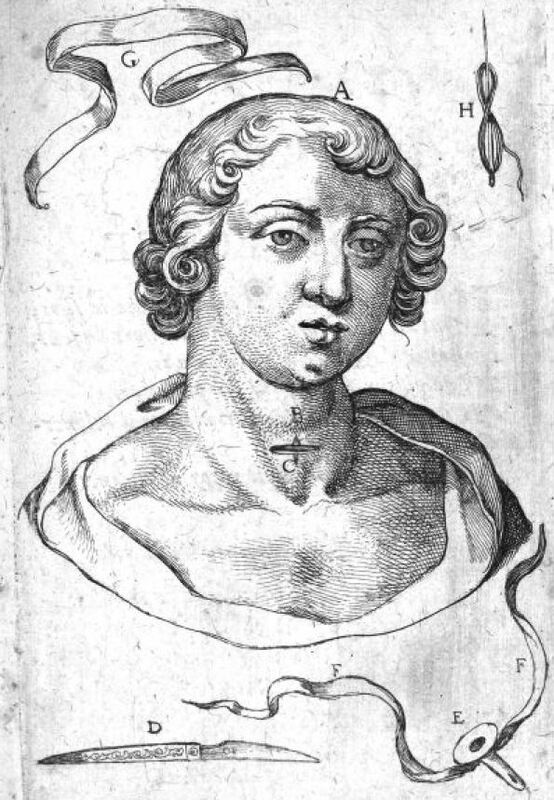 Illustration from Habicot’s ‘Question chirurgicale’, showing instruments and location of incision for tracheostomy. The item marked ‘E’ is a breathing tube to be inserted through the incision. a boy aged 14 or thereabouts, from Noisy near Villepreux, to whom somebody had said that eating gold did no harm. Noisy-le-roi, a commune about 15 miles west of Paris. A pistole was a large gold coin. …and being nervous of thieves, he put them inside a linen cloth which he swallowed. Not the most sensible option. Even hiding them under a mattress might have been preferable. But since this would not pass through the pharynx or oesophagus, his face turned black and swollen, becoming so hideously deformed that his friends no longer recognised him. Classic signs of oxygen starvation. He was at imminent risk of choking to death. They brought him to my house, but I could neither extract the package nor dislodge it into the stomach, since it was so firmly held in place by the swelling of the throat. Thinking it likely that he would choke, I performed bronchotomy. The procedure we would now call tracheostomy – creating a temporary opening into the trachea at the front of the throat in order to preserve the airway. There was no anaesthesia at this early date, of course, but the operation was mercifully straightforward, entailing a single incision. When this had been done, the air rushing in and out of the wound in his neck made such a violent rattling that those near him were frightened; but the blackness and swelling of his face had disappeared, so I assured them he would not die, especially after I then succeeded in pushing the parcel into his stomach, using a lead instrument introduced into the oesophagus. Eight or ten days later, he passed the coins at stool, at different times, and so did not lose his money, nor indeed risk it so much as he did his life, for which he was indebted to the wound made in his trachea, which afforded him such speedy relief. The tracheostomy soon healed, and the boy made a complete recovery. A successful outcome, and an operation of historic significance.